Is it a customer disconnect or a retailer disconnect? And, therein lies the problem. There is a disconnect somewhere between the perception of what we believe our industry should be doing, and what we actually are doing. Keep in mind, since furniture has a long buying cycle, our industry has the luxury to sit around idly while everyone else is changing to meet consumer demands. Nonetheless, let’s say a consumer wanted a better, more technological experience to furniture shopping. We generally think she has to settle for the old-fashioned showroom buying experience because there are no other means to shopping for furniture. However, that is changing, and changing fast. Online companies are getting really good at learning how to sell furniture online and in mass. According to a Forrester Research Study conducted in 2010, approximately 10 percent of all home furnishing sales happened from the click of a mouse, phone call or tablet device. That number is expected to increase to 33 percent by 2020, according to the same study. We believe that EVERYONE in this industry understands what is happening in the world. They may not know how to execute it. They may not know how to capitalize off of it, but they know it is there. Flip through this magazine or attend a seminar at the last several markets and furniture retailers are aware that social media, online media and all media is available to improve their business. We believe that the long buying cycle of the industry creates barriers for this industry to change. This is because retailers are not feeling the same pressure that other, shorter buying-cycle industries often face. We believe that because the furniture industry is a “Cash on Delivery” business model and what you sell you have to first buy; there are a lot of self-made retailers who worked hard to get to the top. As a result, admitting that there might be another way or approach would be admitting that the way they built themselves up for years cannot work anymore. That’s a tough pill to swallow. Use Social Media: Create a personal profile on Facebook, Twitter and Pinterest. The only way for you to understand the impact social media can have on your business is for you to understand it, digest it and implement it personally. Follow your friends—and your competitors. You don’t have to tell the world what you ate for lunch, but spend some time listening to the online conversation. Buy Online: Online holiday sales were up 13 percent in 2010, according to the Wall Street Journal, which was more than experts expected. Nine percent of all home furnishing sales were made online in 2008, and these numbers are also climbing. As you decide how to implement eCommerce in your business model, make 12 personal purchases from various industries and online sellers. Study the strengths and weaknesses of your personal shopping experience, from the product catalog, ease of checkout, delivery options, follow up and customer service. Find someone YOUNG to do YOUNG things: You’ve got enough to do without trying to figure out how to update your Facebook page, post a blog, send an email blast and create an online store while learning the buying habits of Millennials. Hire someone young to manage these young technologies. They intuitively understand social media and can aptly share your vision with a massive audience. Know your market: Market research is an expensive investment, not an expendable expense. The Ms. Jones that bought from you five years ago is gone, and a new woman has taken her place. Do you understanding her wants, needs, desires and media choices? Use this perceived fear as an opportunity to envision the customer you want to buy from you by simply doing your homework. Use Traditional with Digital: Experiment with placing QR codes on your newspaper ads or by experimenting with a mobile text program in your electronic advertising. Utilizing these tools will give you insight into what your potential consumer base is like and it will help you understand how these new technologies fit into your marketing strategy. 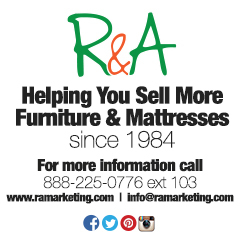 Armed with more than 25 years of furniture retail marketing experience as a full-service traditional and digital marketing company, R&A is the industry’s premier agency for retailers in the home furnishings and appliance/electronics industries. Visit us on the web at www.ramarketing.com or email us at info@ramarketing.com.